Before you learn the basics, on how to set up a spinning reel and how to cast, it helps to know how a spinning reel works. Spinning reels are easy to use and are great for casting lightweight baits or lures. A baitcaster, by contrast, usually requires more skill to use and is also meant for heavier lures or baits. Several physical concepts govern how a spinning reel works, and in a nutshell, it is mounted under a rod instead of over. It also uses a fixed spool. When you crank a spinning reel, a line guide spins around the spool and lays the line on it. Additionally, as you turn the handle, the spool moves forward and back. This causes the line to be layed oevenly over the spool instead of being bunched up at one end. For right-handed people, the rod is held and cast by the right hand, leaving the handle of the reel to be worked on by the left hand. However, most spinning reels have handles that can be switched from side to side. This will allow you to select which hand you want to crank the handle with. 1. Gather the needed tools such as your spinning reel, your spinning rod, your fishing line spool, and a pair of scissors. 2. Before you start putting the line on, you'll want to attach your reel to the rod by placing the reel foot in the reel seat and screwing down the seat so that it's nice and tight. You don't want the reel to move once it's seated. 3. I like to put the tip of the line through the first guide on the rod. 4. Open the bail arm, then use an arbor knot or a uniknot to tie the line to the spool. 5.Once the line is tied to the spool close the bail. 6. Here is the important part. When you look at a spinning reel from behind, you'll notice that it cranks in a counter clockwise direction. As you look past the reel to the spool that the line is coming off of, make sure that the line is coming off in a counter clockwise direction too. 7. Fill the reel until there is about 1/8th of an inch between the line and the end of the spool. 1. Hold the rod with your dominant hand, while using the other to hold the fishing line. 2. Point your pole towards your potential catch. Tilt your fishing pole back at an angle opposite to your target. 3. Swing the pole forward and release the line that you held with your other hand. 4. Wait for a fish to take your bait. These are the basic steps on how to set up a spinning reel and successfully putting one in use, and it can enhance your performance as you head outdoors to fish. 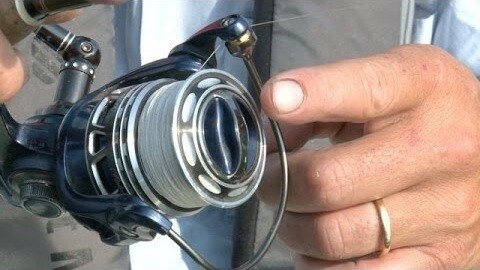 After learning this, you should also learn how to cast a spinning reel. These are only some of the steps you can follow to cast a spinning reel successfully. The most important step is to take precaution whenever you go outdoors to consummate your fishing plans. As you learn the concepts needed for successful fishing, you should also learn how to care for a spinning rod and reel to enhance its shelf life under your care. Doing so can help you save time, money and effort, and all of these can provide answers to your problems with equipment durability. For starters, you should always keep your equipment dry. Wash any traces of dirt from your rods, lines, and reels and pat them dry. Store them in a cool, dry place to prevent them from rusting. If you've used your equipment in salt water, make sure you wash it with fresh water. Lubricate your wheel regularly to avoid your gears from getting stuck. Fishing is a popular recreational activity, especially during the summer. Before you start exploring this new activity, do some research and learn the things you should know to maximize your first fishing experience. Maintain your equipment properly by handling them with care and by making sure they are stored appropriately. Outdoor activities such as recreational fishing have been promoted by many experts due to the emotional, intellectual, mental and physical benefits it can give to an enthusiast which further helps in developing and enhancing an individual's overall well-being. In this regard, knowing the basics of recreational fishing ranging from the equipment needed down to the actual activity is essential for any aspiring angler. Things such as learning how to set up a spinning reel, how spinning reels work, how to cast a spinning reel and how to care for a spinning rod and reel, are only some of the basic concepts any enthusiast should know. The lever you’re referring to is called the bail. Once you get the line loaded on to the spinning reel, open the bail and put the end of the line through the rod guides. The rod guides are the rings on the rod that the line passes through. When the line is all the way through all the guides, you can tie your hook or lure on. Then, close the bail. Closing the bail allows you to reel the line in. Opening the bail allows the line to come off the reel freely. You open the bail to cast. Then, close it to reel in. Most spinning reels have a feature that automatically closes the bail when you start reeling in. Sob once you cast, you don’t have to manually close the bail, you can just start reeling in. Hope this is helpful. Let me know if you have any other questions.